Could anybody explain how I could ensure that corners are printed as modelled? See images of a top-view attached. For so far I could find, it might have something to do with Wall jerk and Wall acceleration speed, but how exactely does this relate to these corners? Should I increase/decrease these values? And, CURA automatically duplicates the outer wall jerk/acceleration to calculate the inner wall jerk/acceleration. What will happen if you keep them the same? It takes a while (not sure how long - 300 milliseconds?) 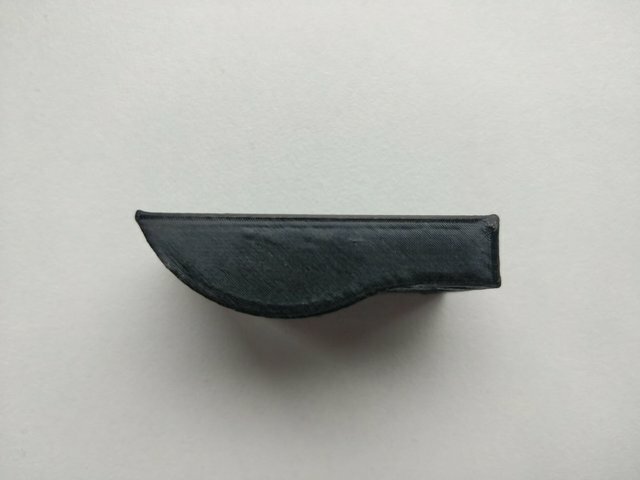 for the pressure to change/stabilize in the print head when you change speeds. Marlin (the firmware in the printer) has to slow down for corners. So it overextrudes on the corners. The speed at the corner is determined by the "jerk" speed (which is different than the official definition of jerk). The jerk speed is the maximum change in speed vector magnitude so for a 90 degree turn if the jerk is 20 the speed at the corner is 14mm/sec (square root of 2 times jerk speed). For sharper corners it's even slower. For very gradual corners like on a circle the corner speed is much higher. Anyway because it slows down on the corner it overextrudes as the pressure in the nozzle is still at the old higher speed equilibrium. The acceleration can also hurt (but not much) as this makes it slow down even more for corners and build up even more pressure. So to get nicer corners you can slow down a lot - say 25mm/sec printing - and disable jerk and acceleration control (or raise the jerk). You mentioned in another thread you didn't like ringing on the corners. Well that's going to get worse if you improve the corners (but better if you slow down). Personally I usually don't care about ringing - I care about better corners. My parts are more functional and don't need to look good so I often care about fit and so I usually care about corners. Adding rounded corners in CAD helps things fit together such that you don't have to care about any of this as much. Personally I usually just print slower if a part has tight tolerances. So I could also decrease wall jerk and therefore decreases over extrusion on the corner, right? Also, fully agree with you that dimensional accuracy is more important if it is a balance between that and ringing, at least for our applications.